Riflemen are the undisputed masters of infantry combat. They can use the most powerful rifles and machine guns, wielding them with an ease no others can match. In addition, these troopers spawn with explosive grenades and a suit of body armor, making them a force to be reckoned with on the battlefield. 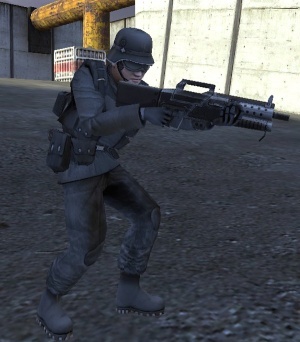 The rifleman's skills are focused on what he does best: infantry to infantry combat. Two offensive skills increase the damage dealt by his weapons, and one defensive skill decreases damage dealt to him. Damage Increase and Vehicle Damage increase damage dealt with hand and vehicle weapons, respectively, and Dig In decreases blast damage dealt to the soldier, reducing it by up to 70%. 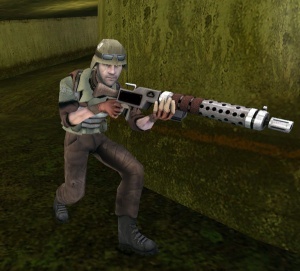 Your accuracy will be much better while crouched with certain weapons like the Heavy Machine Gun. If not using the Heavy Machine Gun, the extra ammo skill is crucial. Explosive grenades are very effective against infantry, turrets, and even heavy tanks (you'll see tanks shake when hit). The trick is getting close enough to use them without getting killed. The secondary fire button on rifles allows you to zoom in. The zoom level is nothing like the Scout's ranged rifle, but it helps nontheless.